Agriculture has been feeding the world for 20,000 years, but in all that time their have only been a handful of crops that have feed the majority of the worlds population. Whether those crops are consumed directly or as feed for animals, the world’s population is reliant on these food parcels from nature. We farm and consume fast amounts of these roots, fruits, grains, and pulses. Maize or as it is more commonly known, Corn, is a crop that is is almost every food product you purchase in some form or other. 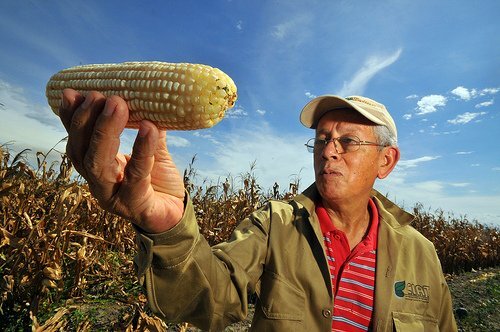 Maize was originally cultivated in the prehistoric era by indigenous tribes of what we now refer to as Central America. Maize was brought to Europe in the late 1400’s. From the Americas and Europe maize cultivation spread around the world as the robust plant can produce a solid crop in many climates. Yellow Maize, Sweet Corn is mainly grown for human consumption, whilst white maize is grown for feeding livestock. The USA is the worlds largest producer of maize followed by China, and then Brazil. Maize has become a major biofuel crop, with the price of maize now tracking it’s fluctuations with the price of oil. Maize is used in the production of thousands of non-food products including; Adhesives, Aluminium, Batteries, Cosmetics, Explosives, Ink, Insecticides, Insulation, Cardboard, Carpets, Wallpaper, and Toothpaste. One bushel of maize refined into corn syrup can sweeten around 400 cans of coke. You can find corn derivatives, it’s sugars, and starches in potato crisps (potato chips for our North American readers), chewing gum, ice cream, peanut butter, vitamins, fruit juice (sweetened), yogurt, bread, salad dressings. Corn Starch, or corn flour is used as a thickening agent for sauces, stews and soups. Nutrient content of the maize crop per 100 grams is 3.2g protein, 1.18g fat, 19g carbohydrates, and 2.7g of fibre. Potatoes come from South America originally and after first being domesticated around 2500 BC they were transported to Europe in 1536 by the Spanish. They come in many verities, but those that are most adaptable to different types of cooking tend to be the main commodity crops we see in our supermarkets. 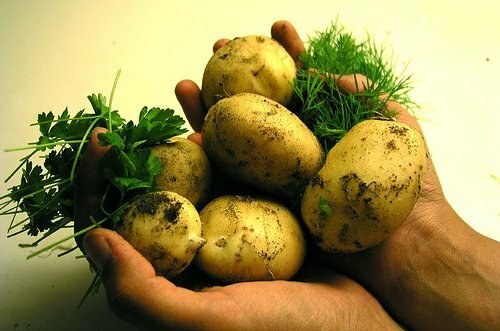 The humble potato is the worlds largest food crop following rice, wheat and maize. In 2008 there were 314 million tonnes produced worldwide; Now thats a lot of french fries! China is the words biggest producer of potatoes. Sometimes a society can become so reliant on the potato that an agricultural disaster can quickly become an ecological and sociological disaster resulting in mass famine and migration. The great potato famine in Ireland between 1845 and 1852 killed 1 million. As a result of the famine a million Irish emigrated to find food and work. Ironically the potato became more expensive than gold in the klondike for a short period in 1897 as a server food shortage push up prices. On a lighter note the Incas measured time by how long it took potatoes to cook. Nutrient content of the potato crop per 100 grams is 2g protein, 0.09g fat, 17g carbohydrates, and 2.2g of fibre. Sweet Potatoes are a relatively modern import to the UK, having being popular in North America for centuries. Sweet potatoes have been dated back to 8,000 BC in South America. The first Europeans to eat Sweet Potatoes were members of the 1492 Columbus expedition. George Washington Carver, an American botanist named after the first US president, planted them on his farm in Virginia. Sweet Potatoes are roots, unlike Potatoes which are tubers (underground stems). A Taiwanese company has made fuel from sweet potatoes. Nutrient content of the Sweet Potato crop per 100 grams is 1.6g protein, 0.05g fat, 20g carbohydrates, and 3g of fibre. 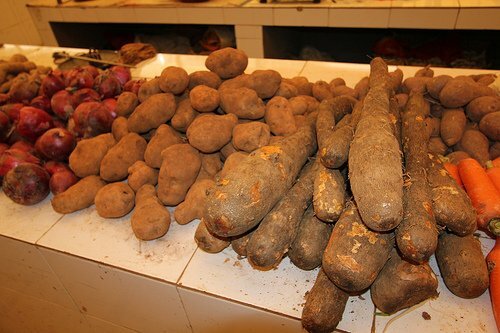 Yams are a stable food in West Africa and the Caribbean. In North America they are sometimes mistakenly called Sweet Potatoes. Whilst Sweet Potatoes are similar they do not come from the same genus of plants. 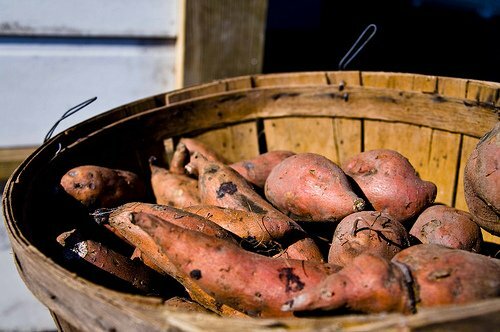 Originally cultivated in Asia in 8,000 BC, yams are now a staple diet in Africa and the Caribbean. There are over 150 verities of cultivated Yam. Yams have been used to make steroid drugs and contraceptives. Mexico had a thriving industry in producing Yams for drug production. Nutrient content of the Yam crop per 100 grams is 1.5g protein, 0.17g fat, 28g carbohydrates, and 4.1g of fibre. Cassava is a native of South America that is now more commonly associated with African cooking. Nigeria is the worlds largest producer of Cassava. 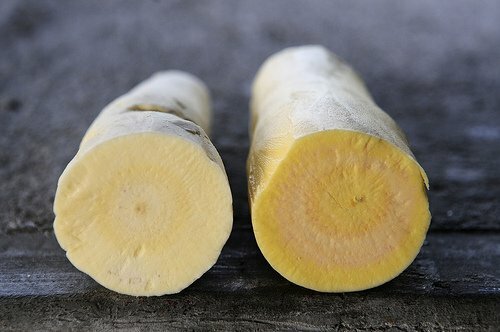 The tuberous root forms the staple diet to 500 million people. It’s a great source of Carbohydrate and weathers extremely well in drought ridden soils. Tapioca, another name for this food stuff is obtained by drying the root. This plant needs to be well prepared before consumption as it contains a natural form of cyanide. Nutrient content of the Cassava crop per 100 grams is 1.4g protein, 0.28g fat, 38g carbohydrates, and 1.8g of fibre. Soybeans are a species of legume that originate from Asia. The soybean is an amazing vegetable source of protein used in animal feeds and increasingly ready meals. In protein terms, soybeans are one of the highest yielding crops commercially grown. The beans are oftern processed into a textured blocks that are used in cooking to replace meat products. Tofu and soy milk are popular in the western world, and fermented soy beans have been the condiment of choice, in chinese take aways in the form of soy sauce. Soybean oil is the most widely used vegetable oil. It is found in margarine’s, salad dressings, canned foods, sauces, bakery goods, and processed fried foods. Soy protein contains all 8 essential amino acids and is considered a complete protein. During the American Civil War, soybeans were used in place of coffee because real coffee was scarce. Oil produced from the plant is used in many non-food industrial applications. 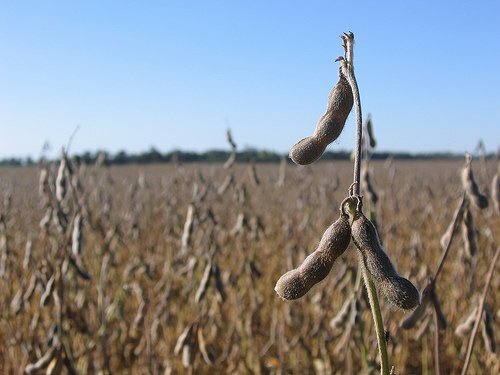 Soybean oil provides an environmentally friendly biofuel for diesel engines. There is a worldwide debate surrounding the production of biofuel as more land is taken away from food production at a time when the world is falling short of food. Soy ink is used to print newspapers and textbooks. Soybean is used in plastics, wood adhesives and textiles, candles, crayons, cleaning products and hair-care products. The worlds largest producer and consumer of soybeans is not china, as you might expect, but the United States. They were first brought to the US from China by sailors on board a Yankee clipper, using the beans as a cheep source of ballast. Nutrient content of the soybean crop per 100 grams is 13g protein, 6.8g fat, 11g carbohydrates, and 4.2g of fibre. Sorghum originated in Egypt between 6,000 and 4,000 years ago. 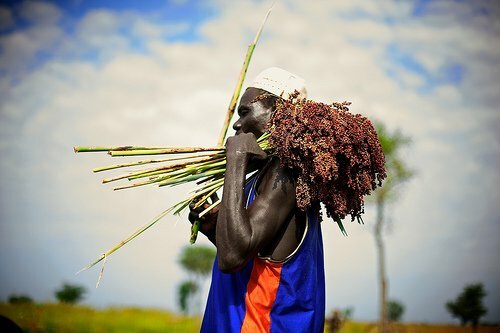 Today sorghum is Africa’s second most important cereal crop. Sorghum (also known as Milo) is a coarse, upright growing grass. It is capable of being grown in a wide variety of soils and climates, making it a very useful crop in arid and drought conditions. Sorghum ranks fifth among the most important cereal crops of the world, after wheat, rice, maize, and barley in both total area planted and production. Sorghum’s major use in the US is as livestock feed. In Africa it is mainly consumed by the human population. Benjamin Franklin is often associated with the introduction of sorghum to the United States. Since 1976 Wewoka in Oklahoma has been holding a sorghum festival every october that is attend by 40,000 people. In years where sugar has been expensive, sorghum was often used as a sweetener. Sorghum syrup is a traditional breakfast accompaniment in southern Appalachia, a region of the United States that stretches from North Georgia to west Virginia. With the increased diagnoses of Celiac disease (an auto immune disease in which the lining of the gut reacts to gluten, a component of wheat), sorghum is becoming an increasingly important food crop in Europe and North America. Sorghum can be made into bread, porridge, and beer. Sweet Sorghum is the pure juice extracted from sorghum cane. This juice is then evaporated to form syrup and other forms of sugars that can be found in a variety of products. Sorghum is a good source of iron, calcium and potassium. Nutrient content of the Sorghum crop per 100 grams is 11.3g protein, 3.3g fat, 75g carbohydrates, and 6.3g of fibre. Plantain a cousin of the banana is a major food crop in equatorial Africa and Andean regions. The plantain crop can be grown and harvested all year round which means it does not need to be stored. 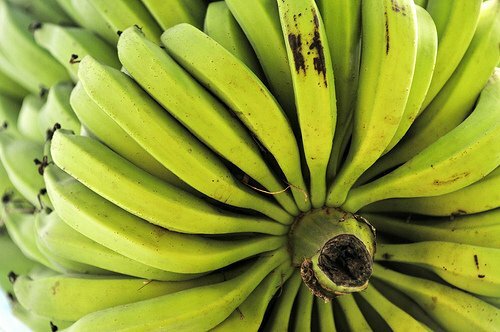 Plantains are harder and firmer than there sweeter tasting cousins and tend to be used as a savoury component in meals. Most often plantain are prepared as a cooked food stuff and are a very good source of fibber and potassium. As a food staple the plantain ranks tenth in the world. Often associated with Africa and the Caribbean, plantain actually originated from South East Asia. Uganda is now the worlds top producer of plantain. Plantains are used to produce Chapo Juice, an alcoholic drink in Peru. Interestingly unlike the other nine main crops that feed the world, the plantain can not produce seeds and has to be propagated by cuttings taken from the plant. Nutrient content of the plantain crop per 100 grams is 1.3g protein, 0.37g fat, 32g carbohydrates, and 2.3g of fibre. Wheat is the worlds most farmed crop by surface area. Wheat is perhaps associated with farming more than any other crop, it is quite literally our daily bread. The cultivation of wheat for crops was first thought to be in an area that is now modern day Iraq in the Tigris river valley. The word Cereal, comes from the name of a Roman goddess, Ceres, who it was believed protected the wheat crop. It was not until the late 1700’s that wheat was planted in the US. Today Wheat makes up three quarters of the US grain harvest. 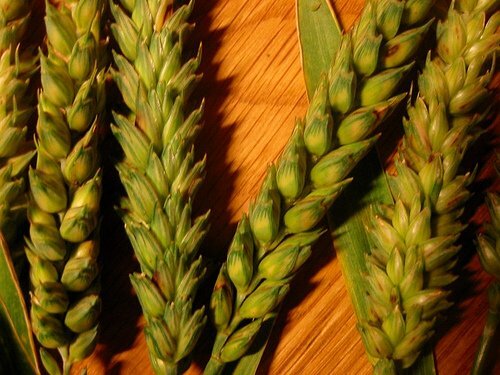 Wheat is the largest source of vegetable protein in the world. The ability for early farmers to mass produce wheat crops and it’s ease of storage made civilisations early cites possible. Before the wheat crop, more labour was needed for farming, leaving little time to build cites and requiring more of the population to work in agriculture. Nutrient content of the wheat crop per 100 grams is 13.7g protein, 2.47g fat, 71g carbohydrates, and 10.7g of fibre. Rice is the stable of any asian diet, and is grown on every continent, with the exception of Antarctica. Rice feeds half of the worlds population and is the second most important world crop after maize. However as the use for maize diversifies, Rice has over taken maize as the worlds most important food crop in calorific terms. There are over 40,000 varieties of rice. Rice is a symbol of life and fertility, which is why rice is traditionally thrown at weddings. Rice cultivation can be dated back to 5000 BC. There is a debate about the original source of rice, some believe it is China, and some believe it is India. Rice is the staple food of Japan, where they tend to go for the smaller grain varieties. China is the worlds largest producer of rice. 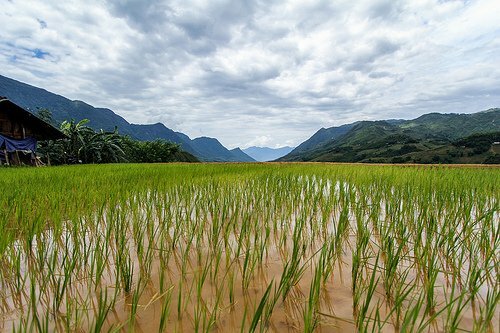 Rice can be grown in any normal field, however as rice can germinate and grow out from under water, Paddy fields are used to reduce the labour required to remove weeds from the crop. Weeds can not grow in the flooded fields. The paddy fields also illuminate the vermin, that would otherwise feed on the young rice shoots. Unlike wheat, rice does not contain gluten, and is therefore suitable for gluten free diets. Nutrient content of the rice crop per 100 grams is 7.1g protein, 0.66g fat, 80g carbohydrates, and 1.3g of fibre. So without these ten crops that feed the world we would be in real trouble today. With the need to feed the worlds population, pre-agricultal methods of subsistence, namely “hunting and gathering” would simply not support the 8 billion people that need breakfast, lunch and dinner eveyday. A small amendment: George Washington Carver was an amazing scientist, but he was never president of the U.S. Rather, he was named after one. Hi Karen, thank you for spotting that. We have amended the article.